Rent The Compound Restaurant | Corporate Events | Wedding Locations, Event Spaces and Party Venues. The Compound Restaurant has a heritage rich in history and regional influences. Before its incarnation as a restaurant, this adobe home was the centerpiece of a group of houses on Canyon Road known as the McComb Compound. The Compound Restaurant is a Santa Fe landmark location with indoor and outdoor dining spaces for intimate parties and large scale affairs. No matter the size or occasion of your party – be it a luncheon for ten, a unique social gathering for fifty or exclusive use of the entire restaurant for 200, we offer a number of settings for your private event. We can accommodate intimate parties for 10 to 24 guests in one of two private dining rooms, larger private parties for 50 to 70 in The Sun and Moon Room, cocktail receptions on one of our three beautiful patios or a buyout for 200 or more guests. 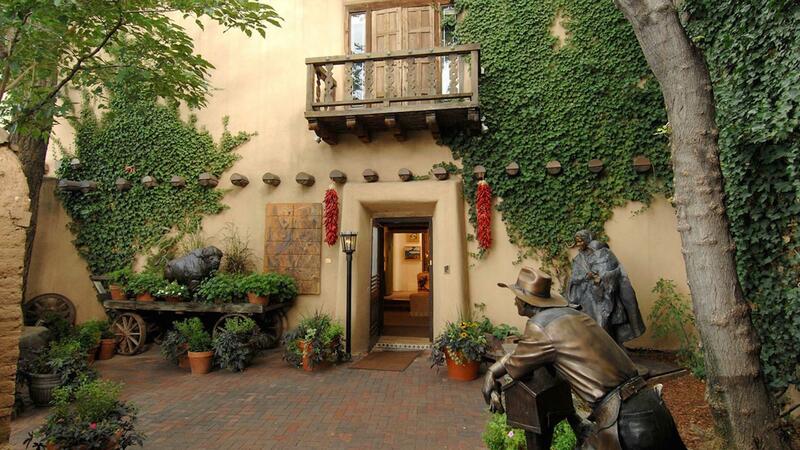 The Compound is the largest free-standing, fine dining establishment in Santa Fe and is available for wedding celebrations, social affairs, corporate events, anniversary dinners or business meetings. The Garden Room overlooks two of our patios and a luscious private garden. This charming room boasts a candlelit kiva fireplace and can accommodate up to 18 guests on one table. The Exhibition Kitchen also features a candlelit kiva fireplace. This distinct space can be specialized for your group to be as interactive or unobtrusive as you like. Tables can be arranged in a variety of ways to best suit your needs, comfortably seating a maximum of 24 guests. For an additional minimum, you may book The Exhibition Kitchen room along with our Chef Mark Kiffin, who will customize your entire menu and prepare it in front of your guests in the open kitchen – a very special option indeed! The Garden Patio, just beyond our rear dining room, features a picturesque garden, an Italian Marble fountain, a European style awning, and a multitude of flowers. The Garden and Garden Patio are available for cocktail parties, rehearsal dinners, weddings or corporate events May to late September/early October, weather permitting. The Garden Patio can accommodate a cocktail party for 75 guests or a seated dinner for 46 guests, and has an overhead heating source. The Side Patio opens from our step down bar, featuring a smaller garden with equal charm, which is optimal for cocktail parties or private seated dinners under the vibrant New Mexico sky. The Side Patio can accommodate up to 32 guests for a sit-down luncheon or dinner and can be easily tented to avoid inclement weather.